A new dinosaur with a large, prominent nose has been discovered in northern Mexico. The duck-billed dinosaur, Latirhinus uitstlani ("lati" is Latin for "wide" and "rhinus" means nose in Greek), lived during the Late Cretaceous approximately 73 million years ago. Found in Coahuila state, it is described in the latest issue of Historical Biology: An International Journal of Paleobiology. Its wide nasal cavity might have given it incredible smell-detecting ability. "Also, it might have supported and provided enhanced space for a soft tissue structure, sort of like an inflatable bladder, for display, recognition and communication purposes in general," lead author Albert Prieto-Mrquez told Discovery News. Prieto-Mrquez, a postdoctoral fellow at the Bayerische Staatssammlung for Paloontologie und Geologie in Munich, analyzed the fossils of the dinosaur with colleague Claudia Ines Serrano Braeas. In addition to its big nose, the dinosaur possessed sturdy hind limbs ending in three toes, and relatively smaller and thinner forelimbs ending in 4 digits- meaning this animal was thumb-less. "When walking and feeding, Latirhinus would normally walk on four legs, although when it needed to increase the pace and run, it could rise on its two hind legs," Prieto-Mrquez said. "A long tail would extend posteriorly to counterbalance the anterior part of the body." He added that these dinosaurs were herbivores with "a few thousand teeth closely packed together to form a grinding surface to chew the vegetation they fed upon." Present-day northeastern Mexico, 73 million years ago, was the western half of two major continental landmasses that formed North America. The Cretaceous Western Interior Seaway is the body of water that split the two sections of land. The environment that Latirhinus inhabited was likely warmer and more humid than it is today, with lakes and bays nearby. Prieto-Márquez said the new dinosaur is important for at least four major reasons. "First, it expands our knowledge of the diversity of hadrosaurids (duck-billed dinosaurs) both anatomically -- it shows us how hadrosaurids were able to evolve really bizarre structures to become better adapted to their environment -- and regarding biodiversity, adding yet another new genus and species of these animals," he said. Secondly, it helps to fill a gap in our knowledge of the fossil record of these animals in southern North America. He explained that dozens of duck-billed dinos have been unearthed in southern Canada and the Western Interior of the U.S. over the past 150 years, "in contrast to the comparatively sparser fossil record in the southern region of the continent." Thirdly, this dinosaur, along with another one called Kritosaurus, provide a link between North American and South American dinosaurs of their kind. Finally, the dinosaur strengthens prior speculation that this type of dinosaur and its relatives dominated the region back in the day. Terry Gates, a research fellow at Ohio University, told Discovery News, "We have known for years that several kinds of duck-billed dinosaurs lived in Mexico during the Late Cretaceous, but diagnostic specimens have been hard to come by. Dr. Prieto-Mrquez is one of the leaders in the field of duck-billed dinosaurs and has a keen eye for detecting differences among species." Gates hopes that more information will become available about the dinosaur, such as its size and weight. 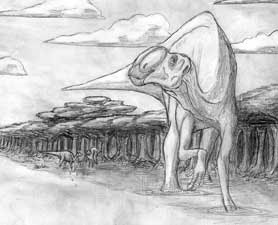 Duck-billed dinosaurs, in general, tended to be large, with some growing to about 30 feet in length and weighing in excess of 6,000 pounds.